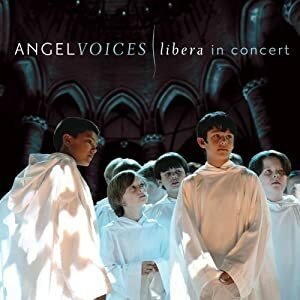 I stumbled on the following group called ‘Libera’ quite by accident. I listen to music practically all day long – no joke, either in my private lessons with students – or while writing, talking with friends or returning emails – preparing lesson plans or just relaxing. This song kept playing on my Pandora radio over the internet. I tailor make my radio station to play quite an eclectic mix of different genres and time periods. Oddly enough the title of this ‘radio station’ is Aled Jones Radio – and it has been this way for quite a long time, after hearing one song that I really liked, although I cannot remember now just what it was that made me fall in love with it so much that I would devote an entire radio station to songs from this artist. Luckily though, Pandora chooses different songs from many different artists that it thinks I will like based on this one choice that I did – and after months of rejecting and accepting songs as they would play – I have about the most perfect mix of instrumental, jazz, contemporary, soundtracks, light classical and the like. So as I was saying – this song has come across my list of songs and piqued my interest because of the pure sounding vocals. I remember thinking to myself while too busy to look, ‘this has to be a boy’s choir’ – and sure enough – IT IS! There is NOTHING like the sound of a prepubescent male voice – no vibrato – just pure angelic sound – clear and effortless. I’m sure you will be as impressed by these boys as I am – who range in ages from 7 to 14. Below the video – there is a little information on the group that I also found on Pandora. Our pastor used a great illustration several months ago. He told about the redwood trees found in Northern California. Greg and I know all about the redwoods because this is where Greg and I pastored a small church for 3 1/2 years in the early 90’s. 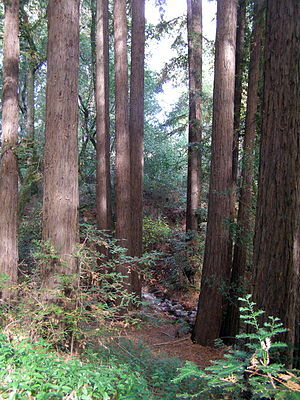 Redwood trees are the largest trees in the world. So large that you can drive a car through them – and in fact there is a tree with a hole cut out of it where a car COULD drive through – we’ve been there to see it. But something very strange about these trees – their roots are actually very shallow – only a couple of meters deep. You would think that for trees this size – the root system would wind down for hundreds of feet and they would be very strong and invincible. But they are not. They are very vulnerable by themselves. Their real strength comes from the other trees. They act as a barrier and protection when close together. We have much to learn from these massive beautiful trees. They appear so strong and stable. But they have a weakness. And like the trees, so do we. We cannot stand alone. Oh I guess we CAN – but we SHOULD not. We need each other. We are fragile – like these trees. Who are you close to? Do you have anyone in your life that acts as a barrier and protection? Who has your back? We started a small group in our home with other like-minded and fragile people. As we share our stories of joy and pain – it is good to know that we were never meant to do life alone. We need each other. I need support and help from my brothers and sisters – those who can share my everyday battles, opportunities and circumstances – but who also have my back when life goes sideways – giving support and holding me close, offering assistance and encouragement to keep me from giving up – or from falling over – like a tree. I’m thankful for the people who God has placed in my life and along my journey to help to encourage me, lift me up and be there to protect and love me – when I mess up, get it wrong and need a little extra grace. My friends – the trees in my life.